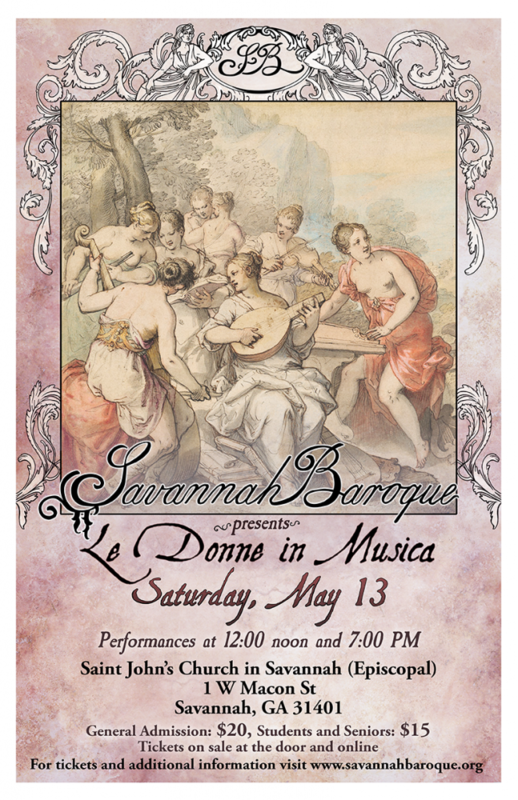 Savannah Baroque presents “Le Donne in Musica“, a concert performed on period instruments featuring evocative works that celebrate women including selections by Elizabeth Jacquet de la Guerre, Isabella Leonarda, Thomas Arne, Handel, Titelouze, Heredia, and William Byrd. Anne Acker, harpsichord; Marcy Jean Brenner, viola da gamba; Ann Cafferty, baroque violin; Jeana Melilli, baroque flute; and soprano Ashley Roper. 1 W Macon St., Savannah, GA 31401. Performances at 12 noon and 7 p.m.